"The Girl With Grit" commemorates the services given to the nation, the region and the town of Griffith, New South Wales, by the Australian Women's Land Army in a time of special need during World War Two. To meet the shortfall in rural labour, State and private women’s land organisations were organised, modelled on those established in Great Britain during the First and Second World Wars. A national body was formed on 27 July 1942 under the jurisdiction of the Director General of Manpower. While policy was devised by the Commonwealth Government, the organisation of the AWLA remained State-based. An extensive recruiting campaign was undertaken for new members. THIS MONUMENT IS A TRIBUTE TO THOSE WOMEN WHO SERVED IN THE AUSTRALIAN WOMEN’S LAND ARMY (AWLA) DURING WWII. THE AWLA, SOMETIMES CALLED THE “FOURTH FORCE”, WAS MODELLED ON PROGRAMS ESTABLISHED IN GREAT BRITAIN DURING THE FIRST AND SECOND WORLD WARS TO MEET A SHORTFALL IN RURAL LABOUR. RECRUITS IN AUSTRALIA WERE BETWEEN 18 AND 50 YEARS OF AGE AND WERE ALL VOLUNTEERS, PAID BY THEIR EMPLOYERS RATHER THAN GOVERNMENT. THESE WOMEN WERE RECRUITED BETWEEN 1942 AND 1945 FROM THE URBAN FRINGES AND SENT TO AGRICULTURAL COMMUNITIES ACROSS THE COUNTRY INCLUDING THE RIVERINA. “THE STORIES OF THE AUSTRALIAN WOMEN’S LAND ARMY ARE INSPIRING. MEMBERS OF THE LAND ARMY BELIEVED IT WAS THEIR PATRIOTIC DUTY TO FEED THE TROOPS, A TASK MORE IMPORTANT THAN THE SPRAINED ANKLES, ACHING MUSCLES, BROKEN RIBS AND SHEER EXHAUSTION WHICH RESULTED FROM THEIR DEMANDING PHYSICAL LABOUR. LAND ARMY WORK RANGED FROM FRUIT PICKING, VEGETABLE GROWING AND PACKING TO WHEAT, SHEEP AND DAIRY FARMING. THE WOMEN, PRIMARILY FROM CITIES AND TOWNS, WERE NEVER WARNED ABOUT SNAKES, DUST STORMS, LOCUSTS AND LEECHES.THEY ENDURED HARDSHIPS THEY NEVER IMAGINED FOR THE SAKE OF “DOING THEIR BIT” FOR THEIR COUNTRY AND ITS TROOPS OVERSEAS.THE WOMEN’S STORIES DETAIL WONDERFUL CAMARADERIE, STRENGTH, DETERMINATION AND TO BE FAIR, FUN”. DURING THE WAR, LAND ARMY WOMEN RECEIVED LOWER WAGES, LESS CONCESSIONS AND FEWER MEDICAL BENEFITS THAN OTHER WOMEN’S MILITARY SERVICES AND WHEN THE WAR ENDED WERE SENT HOME WITH THE WORDS “THANKS GIRLS AND GOODBYE”. 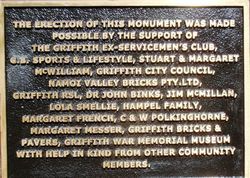 THE COMMUNITY OF GRIFFITH AND DISTRICT, WHERE A NUMBER OF AWLA MEMBERS EVENTUALLY SETTLED, THANK ALL WHO SERVED IN THE AWLA FOR THEIR CONTRIBUTION TO OUR NATION IN A TIME OF SPECIAL NEED. THESE WOMEN WERE TRULY “GIRLS WITH GRIT"
This memorial was unveiled on 11 July 2015 by veterans of the AWLA ; Kathleen Savage, Gladys Burgess, Gwen Chilvers, Margaret French, Ursula Garner, June Gulloni, Dorothy Hales, Margaret Johnston, Lola Smellie, Esme Wirth. Griffith War Memorial Museum with the help in kind from other community members.